Starting a pet business can be a complicated undertaking, and one of the most difficult aspects of the process is often the selection of the right business name (provided you are not becoming part of a pet franchise where the use of the established name is a given). The business name you select will set the tone for the entire enterprise and is the first thing a potential customer encounters in your advertising and marketing materials. This makes the business name an extremely important part of the overall business plan. Choose a Name That Clearly Identifies the Business and Its Services: It is critical that you select a name that is descriptive and gives potential customers some insight into the identity of the business. The business name is the foundation of your brand. It should clearly identify what you do and how you do it. Something generic like “Waggin Tails” or “Good Dog LLC” won’t cut it. Are they pet boarding businesses, groomers, dog walkers, dog training services—who could tell? You need to be descriptive. “Waggin Tails Pet Hotel” or “Good Dog Obedience Training” would be better options. Avoid Overused Pet Industry Phrases Commonly Used as Business Names: Those entering the pet industry should try to avoid overused pet business names like “Noah’s Ark,” “Lucky Dog,” or “Bow Wow.” Pet owners love creative business names, so it is important that you come up with something different and catchy. Don’t settle for the overused phrases that are already pervasive in the marketplace. Put your own spin on a name and make it your own. Try to Keep the Name Short and to the Point: It is always a good idea to keep your business name reasonably short and simple. You can always add a descriptive tagline or motto to your business cards and advertising materials, but the name itself should be crisp and clean. Many pet businesses specify the exact service offered in the name (i.e. 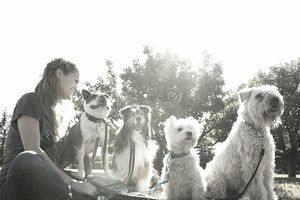 dog training, pet sitting, pet boutique, or pet hotel). Make Sure the Business Name Is Available: Be sure to check the availability of a potential name to be sure that it isn’t already trademarked or in use. Trademark infringement often leads to lawsuits and expensive legal fees. After making sure the name is available you should be sure to register it with all relevant state and local agencies. Check to See If the Domain Name Is Available for a Website: You should check to see if the website domain name is available as a part of your naming research process. Securing the website domain name is absolutely critical for an online pet business. Most brick and mortar pet business storefronts also set up websites as part of their advertising and marketing strategies, either to support online orders or to advertise the products and services offered.